As I opened the box to my size 9 unisex Nada's (Somnio says to order one full size smaller than you usually wear) I found that the shoes came packaged with a nice mesh carry bag and a DVD entitled “Nada 101: An Introduction to Minimalist Running”. I always appreciate when a company sends along educational material and Somnio's DVD is an excellent tool for the beginning minimal runner. It really is a primer on minimal running and provides the runner with some minimal running specific stretches and exercises to ensure that you remain injury free as you incorporate the Nada into your arsenal of running shoes. I wish I had access to this kind of information when I transitioned to barefoot running, it would have saved a lot of time and effort and hopefully prevented injury. When I first picked up the Nada's, I was amazed at how light they are. The upper material is very thin and has almost no structure. I love this feature, the upper is literally only there to hold the sole on your foot. It provides no support whatsoever and the only hint of padding is in the tongue so that the laces don't dig in to the top of the foot. The appearance of the shoe is somewhat understated. It's mostly white with red, black, and silver accents and it only comes in one color scheme. I am rarely a fan of mostly white shoes, but I really like the design of the Nada. The most impressive aspect of the Nada is the sole. I was genuinely excited when I turned the shoe over and started looking at the 10mm thick sole. First of all, it is completely flat. I have learned that my body favors a sole that is completely flat in lieu of one with special cutouts or rounded areas. Second, there is a well laid out tread pattern with some extra reinforcement under the forefoot. Finally, the sole immediately reminded me of a thicker foam version of my huaraches, in other words simple. I like simple, but intelligently designed simple is even better. I decided to go for a “two for one” deal with my first run in the Nada's. The Nada's are the first pair of shoes I have owned in over a year with a traditional lacing system and I remembered an article I read a while back on an alternate lacing pattern to allow for a tight fit around the ankle and midfoot, but a nice loose forefoot and toe box. I laced them up, and they felt great so I took off for a quick 5 km. The first thing I noticed about the Nada was that even with a 10mm foam sole, they still have a very respectable amount of ground feel. If this was my first experience with a minimal shoe, I would have been completely blown away. As I progressed through the run, the tiny bit of cushion that the sole provides fades away and is hardly noticeable. I am not a fan of a cushioned shoe so this made me very happy. The Nada performed exceptionally well on every surface and was steady and sure running both up and down hill. The toe box is very roomy, but my foot never felt lost in the shoe. The lacing system certainly contributed to the comfort of the run, but I can see how it would not be for everyone. The only concern I have with the Nada is longevity of the sole if the shoe were used as a daily runner. The material is quite soft and I think it will wear away quickly. Somnio suggests that the Nada be used as a supplemental trainer to help strengthen the feet and legs. If you were to use the shoe as once per week training exercise, I don't think longevity would be an issue. For me personally, the Nada is a bit too much shoe for a daily runner. 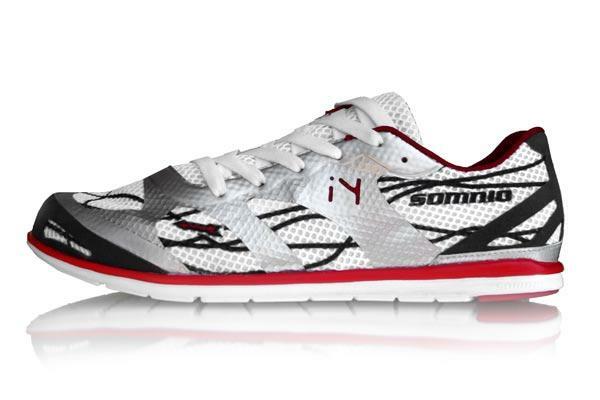 That being said, since Somnio designed the Nada as a transition shoe and a niche trainer, it is a brilliant shoe for the beginning minimal runner. After only one run, I can honestly say that if this shoe had come into my life as I was transitioning to minimal running I would have had a much easier experience and may have avoided some injury. As a more experienced barefoot runner, I can imagine using the Nada as a racer for either terrains or distances that I wouldn't feel comfortable running either barefoot or ultraminmal.